What a revelation! I have been to Yorkshire before, even to Leeds and loved it but this trip was another experiment in finding out what art is still accessible to me. I chose it because I knew it would cover big subjects, not only in cultural terms but in actual size, and I was not wrong. This was an organised tour and we were lucky to have art expert, Gerald Deslondes, as group leader. He took us effortlessly through the different influences and developments in 20th Century art in a way that contextualised so many different aspects that can be puzzling and sometimes difficult to accept. In many ways I found that, even though I could not see all of the work, I was able to draw on past experience and see what I could see in a different light. And talking of light, how bright were the various places we went to. This made viewing so much easier than in those galleries with energy saving lights and a deep sense of gloom. 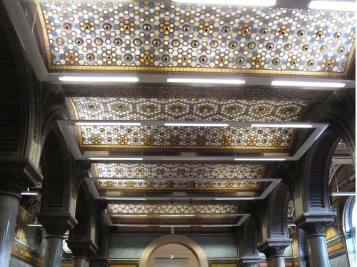 The exquisite Leeds Art Gallery was a surprise with it’s gorgeous ornate ceiling and massive glass cupolas showing off the collections ranging from grand Victorian oil paintings to Bridget Riley’s geometric line canvas. 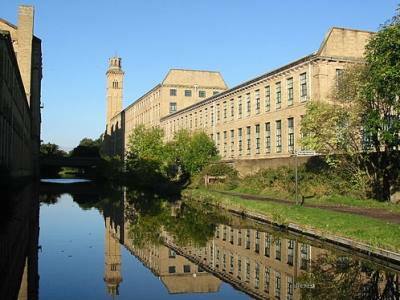 The largest industrial building in the world at the time of its opening, Salts Mill opened as a mill in 1853 by Sir Titus Salt. Built as part of a model village it stands overlooking hills and trees and is now home to a variety of art and antique outlets as well as a large David Hockney collection. It was the Hockneys we came to see. Set in the long, relatively low ceilinged floors of the mill they glow out in their industrial setting. Bright collages of trees, portraits, drawings and colour dazzle the eye. Whatever your taste or understanding of Hockney this was stunning and, for me, easy to see. The Park was opened as a Trust in 1977 in the grounds of Bretton Hall. The grounds were designed by a contemporary of Inigo Jones and form a wonderful setting for art ranging through Barbara Hepworth’s Family of Man, Henry Moore’s chunky ladies, Elizabeth Frink’s men with bird-like legs to the kitsch Buddha all glitz and colour and, my most startling image, an installation Roger Hiorns, Seizure, 2013. When the building for his bedsit was preparing for demolition, he sealed it off, created a solid structure around it and filled it with copper sulphate. The installation was moved to the Yorkshire Sculpture Park at huge expense and you can walk into this strange space with walls and ceiling covered in blue, blue, blue crystals. Is this art? I don’t know but I found it a magical and sinister experience. The sun shone, the shadows emphasised the sculptures and, above all, I could see everything. Sadly and understandably, you are not allowed to touch the exhibits but the temptation was difficult to resist. It was good to see so many children dancing and lurching around on the grass perhaps absorbing their surroundings. Probably my favourite Gallery, anywhere, is Barbara Hepworth’s house in St Ives, Cornwall, where her sculptures are shown in the tangle of her garden and the whiteness of her studio. She didn’t have an easy time of it in the early days with her 4 children and Ben Nicholson and Henry Moore vying for supremacy, but I like her work best. 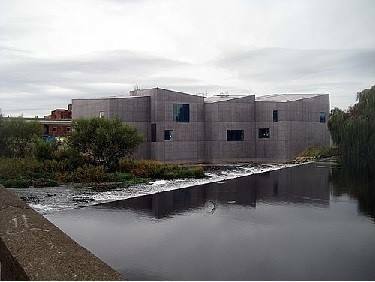 The Hepworth Wakefield gallery houses a fine collection of 20th and 21 century art. Chief among them Hepworth’s work. The gallery is light and bright and many of the sculptures are large. Great for someone with low vision. It’s superb and I want to go back. I have made no attempt to write about the actual art we saw as I really wanted this blog to be an incentive to people with VI to give art a go. The Yorkshire galleries are a good start because of their size and grandeur. If you don’t like modern art this is a challenge but, I believe, one worth meeting. I didn’t check out any visual aids because, for me, it wasn’t necessary but I am sure they exist. Incidentally, entrance to Leeds Art Gallery is free. Warning, if you are traveling to Leeds by train, book in advance, it is a very busy service and poorly managed but you can get help at your station of departure and Leeds. 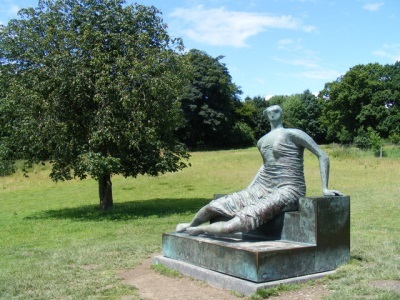 This entry was posted in Art, low vision and tagged art, Leeds, low vision, sculpture, Yorkshire. Bookmark the permalink. Hockney color is good for low vision! I liked reading about your Leeds tour. Glad you liked the blog. It was good to find how much art is still out there for low vision people! . Wish you could take the tour too! A lovely post, so much to do on what sounds like a great tour, and inspiring to people who might think that they’ve had to leave art behind. I think quite a few galleries do experiences where you can touch some of the sculpture – I’d love to read about what that’s like. It would be interesting to know what galleries do provide for people with VI. Thanks Liz, good suggestion. Ill make an effort to look into it. Will start with Birmingham Museums and Art Gallery where there are some interesting sculptures. Sounds fascinating. Great to have the opportunity to see such a diverse range of art and culture so close to home. Where to next? I’d recommend Glasgow. Not just the city itself, which is relatively easy to get to and grandiose in its design, but also some great museums, art galleries and grounds that are easily accessible and, like the Kelvingrove or the Burrell collection, both in lovely open settings (I’m not getting a commission on this, honestly). Any other places people recommend? Sounds fascinating. Great to have the opportunity to see such a diverse range of art and culture so close to home. Where to next? I’d recommend Glasgow. Not just the city itself, which is relatively easy to get to and grandiose in its design, but also some great museums, art galleries and grounds that are easily accessible and, like the Kelvingrove or the Burrell collection, in some lovely open settings (I’m not getting a commission on this, honestly). Any other places people recommend? Thanks for the comment. Good idea about Glasgow. I believe the company who organised the Yorkshire tour do a weekend in Glasgow. Whole new vistas opening up!